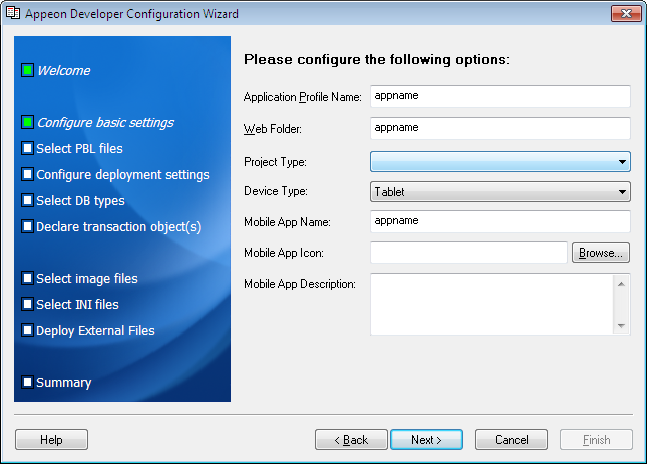 Step 1: On the Appeon Developer toolbar click the first icon Config Wizard ( ). Step 2: In the welcome screen click Next. Step 3: Specify following settings and then click Next. 1. Specify the application profile name in the Application Profile Name text box. The same text will be displayed in the Web Folder text box and the Mobile App Name text box. You can modify these fields to use different text. 2. Select Mobile from the Project Type dropdown list box. 3. Select a device type from the Device Type dropdown list box. For applications that are designed for tablets, select Tablet; for applications that are designed for smartphones, select Smartphone; for applications that are designed for both devices, select Both. 4. In the Mobile App Icon text box, specify an icon for your application by clicking Browse to select the image file of the PNG or JPG format. The image that you choose will be displayed as the application icon in the Appeon Workspace. Recommended size is 86 x 86 pixels (or above) for low-resolution display and 172 x 172 pixels (or above) for high-resolution display (such as retina display). To ensure the best display quality in both high-resolution and low-resolution screens, you must supply an image of 172 x 172 or above. The image will be automatically shrunk to fit properly. If you leave this field empty, the default icon will be displayed in Appeon Workspace. 5. Enter a brief description in the Mobile App Description text box. This description will be displayed in the Appeon Workspace next to the application icon. If you leave this field empty, no app description will be displayed in the Appeon Workspace. Step 4: Add the PBT from the PBT dropdown list box (and all related PBLs will be automatically added for you) or add the PBL files individually that are used in your application by clicking the Add File button in the PBL File List group box, and then select a PBL version from the PBL Version dropdown list box. Click Next. Step 5: Keep the default settings and click Next. Since you have installed Appeon Developer and Appeon Server on the same machine, you can directly use the Local Appeon Server profile, the Local Web Server profile, and the Local Deployment profile, all of which are configured automatically by the product setup program. When you click Next the config wizard will automatically test the connection to the server. You will not be able to proceed if the connection test failed. 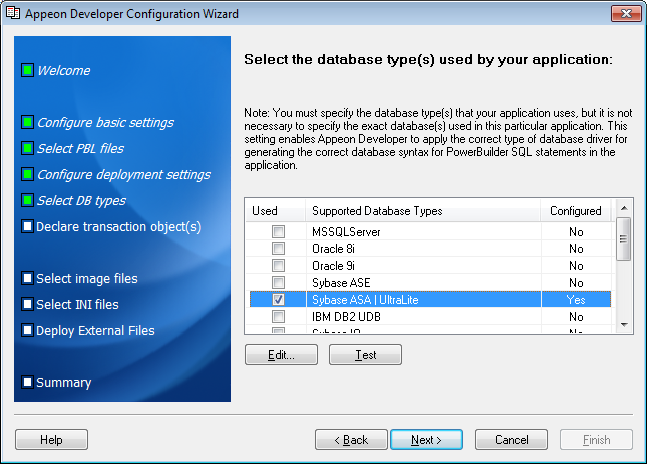 Step 6: Select the database type used by your application and click Next. If the required database type has not been configured in Task 1: Configure the database type, you should highlight the database type, then click Edit, and then follow Step 4 in Task 1: Configure the database type to configure it. 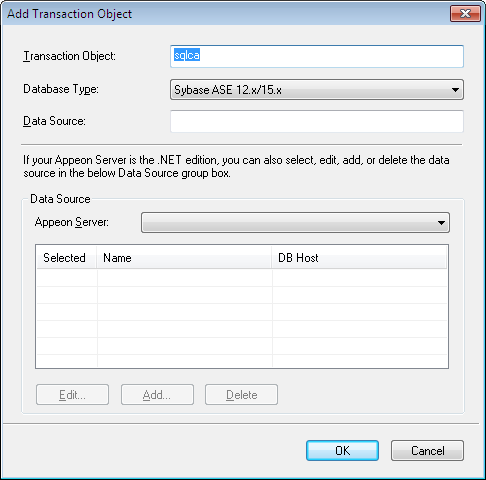 Step 7: Click Add to specify the transaction object(s) used in your application. a. 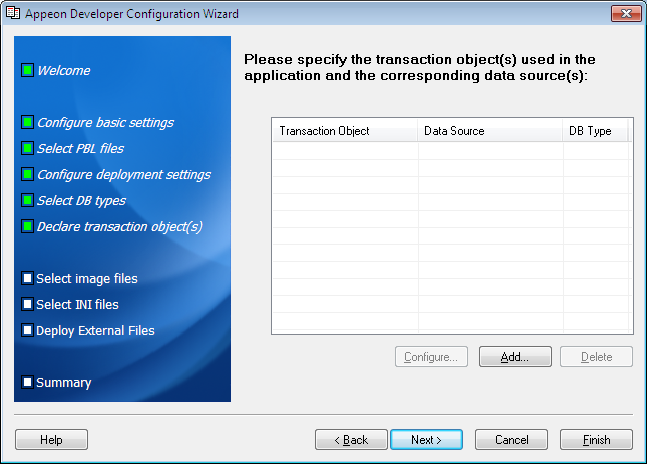 Input the transaction object name used by the application to the Transaction Object text box. Default transaction object for most PB applications is SQLCA. b. Select the database type from the Database Type list box. c. Select Local Appeon Server from the Appeon Server dropdown list box. d. Select the data source from the table. 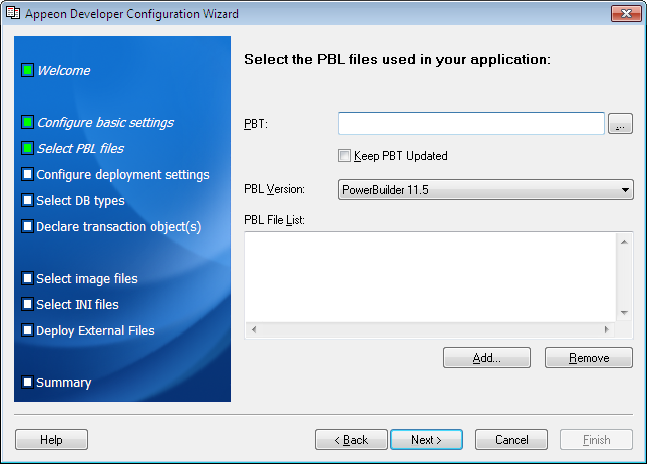 The data source should connect to the same database that the PowerBuilder application connects to. If the required data source has not been configured in Task 2: Configure the database connection, you should click Add, and then follow Step 4 in Task 2: Configure the database connection to create it. Tip: If you have more than one transaction object you can add additional transaction objects by repeating the above steps. Step 8: Click Browse to select the image file or the folder that contains the image files, if any. Click Next. Step 9: Click Add File or Add Directory to select the INI file, if any. Click Next. Step 10: Click Add File or Add Directory to select any other external files such as TXT file etc., if any. Click Next. Step 11: In the configuration summary screen, keep the Deploy the application now option as selected. Click Finish. 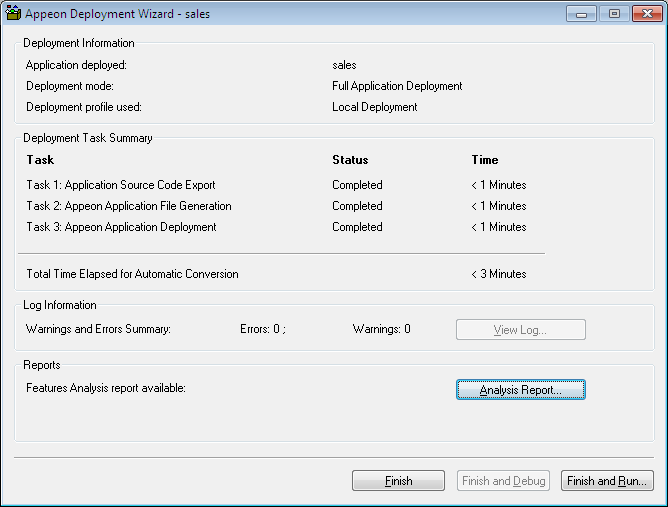 Once you click Finish, the Appeon Deployment Wizard automatically starts deploying the application. 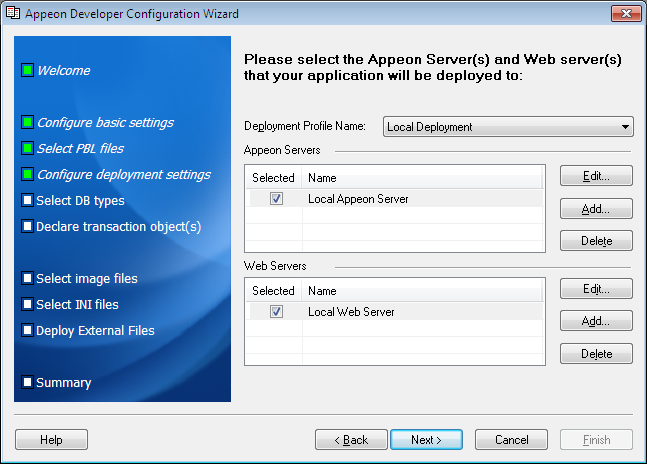 To manually starts Appeon Deployment Wizard, you can click the Deploy icon ( ) on the Appeon Developer toolbar. Step 12: Click Finish when the deployment process is complete.